Total Access Emailer is the most popular Microsoft Access email program. The email addresses in your Microsoft Access databases are a valuable asset. Whether it's a list of customers, employees, friends, prospects, or other contacts, email offers an efficient way to communicate with them. Imagine the power of your emails by merging that with all your other information for each person. Sending emails merged with your MS Access data is a snap with Total Access Emailer. Generate personalized emails for everyone in your table or query. Emails can be in text and/or HTML format, and you can even embed or attach personalized (filtered) data and Access reports for each recipient. Improve your communication and service, and generate results! Total Access Emailer is designed specifically for Microsoft Access and behaves the way you expect. Tightly integrated into Access, it runs as an add-in directly from your MS Access database (ACCDB, MDB, or ADP formats). It includes an interactive, Wizard-like user interface that makes it easy to customize your email blasts in your MSAccess environment. Once launched from the add-ins menu, the main form appears listing all the existing email blasts for this database. The wizard interface makes it easy to create a new email blast, edit one, and send it. Choose any table or query with your email addresses as your data source. This includes local and linked tables. Select the field with the email addresses. Create your subject and message which can reference field values in your data source. Optionally attach Microsoft Access reports filtered for each recipient. You'll be quickly sending personalized messages to everyone. Your email blast settings are automatically saved in your database for reuse and sharing with other users. Total Access Emailer is the easiest way to email Microsoft Access reports! Use your Access report generator to design reports that can be attached as PDF files to your emails. Easily include data from different sources, apply the rich formatting and summaries of Access reports, then email them to your contacts. You can filter the report by contact person to send each person their own information. Total Access Emailer also lets you use your reports as the text or HTML of your email message. Leverage the power of the Access report generator to create custom emails for each recipient. Email Newsletters using Microsoft Access email lists customized to include each recipient's name, address, and other specific data in the email, and sending text or HTML formats based on customer request. Late Invoice Notifications based on a query determining late invoices and emailing the invoices directly to them with different messages based on how late it is. Welcome New Customers based on a query flagging new people added to a database and automatically sending a welcome message. Conference/Meeting Event Reminders. A series of messages scheduled a certain number of days before an event to update people on the latest information and requirements. Human Resources Compliance for internal staff to get missing timesheets and other paperwork for payroll, 401(k)s, flexible spending accounts, insurance benefits, HR news, legal requirements, etc. Emails only go to employees that should receive them based on how employees are tagged and can contain their private information. Membership List Management From school PTAs, sports teams, church groups, and non-profit organizations, tagging participants into different groups makes it easy to send mass one-off and recurring messages while making each of them appear personal. This eliminates the impersonal mass CC or BCC blasts. Green Initiatives and Improved Security to eliminate the use of paper reports and distribute them all via email. This also improves confidentiality and security since people only get their data and paper with confidential information isn't laying around. System Administration Alert to notify someone when certain data changes occur. Can be tied to a specific trigger or continual checking. Plus many more uses. Read some customer comments for more examples. Email specifications created in Total Access Emailer are easily customized for each blast, or just repeated over and over. With its programmatic interface, you can tie the blast to a button or event. You can even set a macro to call it, then send it on a recurring schedule with a program like Total Visual Agent. Total Visual Agent lets you schedule Access chores hourly, daily, weekly, monthly, or just one time in the future. 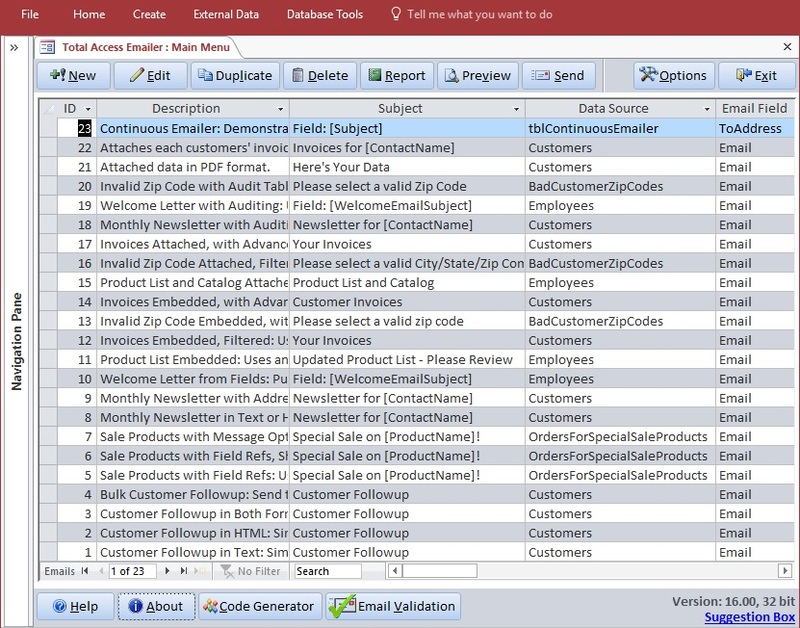 Easily send a message to every email address in your Microsoft Access table, linked table, query, or view. Emails can be sent individually or in bulk as regular email or using CC or BCC. Easily customize the email subject and message for each recipient by referencing field values from your table or query. CanShrink options enhance formatting. Alternatively, you can even specify a field in your data containing the subject and/or message to send so you have complete control over each message. Prepare both an HTML and a plain text message, and send one or the other depending on what the recipient's email supports. HTML messages can be an HTML file or explicit HTML text. HTML messages automatically embed local graphics referenced by the message. You do not need to manually add the graphics as attachments—they are automatically embedded in the email message. Total Access Emailer lets you add multiple attachments per email. Easily attach Access data, objects, and files on disk to your message. Use the same attachments for everyone or filter the data and reports for each recipient. Embedded objects can include data from tables, queries, and reports which can be in formats such as PDF, text, Excel, HTML, and rich text format (RTF). You can also email files stored in an ACCDB table's attachment field. Total Access Emailer lets you compress all your file attachments into one zip file and add a password to protect it. You can use the same zip file name and password for everyone, or apply values from fields in your data source so each recipient has their own zip file name and password. Email blast settings are automatically saved for reuse such as monthly newsletters or late notices. Easily send the email again, or edit it with your latest message. Store an unlimited number of email blast settings and share them with your team. An optional audit trail can be maintained to know when an email was sent to each person. Easily send the same email to new people or to those whom the original message was skipped because the process was interrupted. Specify the FROM address for your emails. Use the same for every email or reference a field from the data source. Print out the detail specifications of each email blast. Before you send your Microsoft Access e-mail blast, the powerful preview feature sends your messages to a table, the screen, or an email address you specify. Easily preview each custom message before you send it. You can test with the entire list or specify a limited number of messages. If Save Files is set, you can preview saving the attached files to your local disk. The 2016 version also introduced the Email Validation button that lets you verify the syntax of email addresses in your data source is valid before sending your emails. Launch the email blast and tell it to start at a specific time. This can be useful for scheduling your emails for a particular time or after hours when your mail server is less busy. Send multiple Microsoft Access email blasts one after the other. This is ideal if you have email blasts that need to go out consecutively, or use multiple data sources for related email blasts. In the event your email blast is interrupted (power, network or Internet failure) and you've turned on auditing, Total Access Emailer can restart the email blast where you left off, ensuring everyone is properly notified without duplication. Track when the emails were sent in a date/time field in your data source and/or save a copy of the email to a table. You can also use the Save File feature to save copies of all attached files. To prevent email viruses, Microsoft Outlook/MAPI makes it practically impossible to send multiple emails programmatically. Users either have to manually confirm messages or run very slowly. This is what happens if you use the Microsoft Access DoCmd.SendObject command or try to automate Outlook. Total Access Emailer avoids this problem by using SMTP rather than Outlook. This is fast and efficient. You can even specify the FROM email address of your messages, which can be different from your Outlook address. By sending email through your SMTP server, Total Access Emailer is compatible with any machine or software that has SMTP (or ESMTP) capabilities, including Microsoft Exchange, and other third party email host services like the free SMTP server from Gmail. You can also configure your own SMTP server on a computer running Internet Information Service (IIS). Total Access Emailer also supports sending messages through mail servers with Secure Socket Layer (SSL) and Transport Layer Security (TLS). The latter is the protocol for the SMTP Server provided by Office365.com. 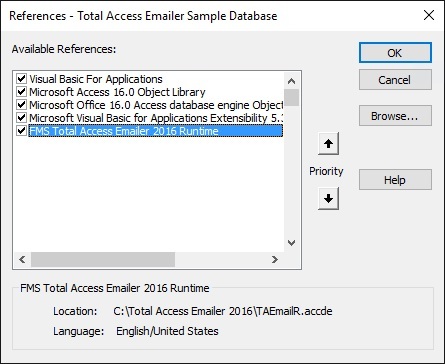 Total Access Emailer is available in two versions. The Standard Version is for end users and includes all the interactive features of the Total Access Emailer add-in to create, manage, and send email blasts. The Professional Version includes the Standard Version, plus a library and programmatic module interface for power users and developers to add email blasts into applications. This lets you use VBA or a macro to send the email blasts you've designed. This version also includes a royalty-free Runtime License that allows the distribution of our library to people who do not own Total Access Emailer. Send and preview email blasts with Save Files option NEW! If your users don't need to create or modify the email blasts you prepare, you can get the Professional Version and not purchase individual licenses for each user. For instance, you can create a button on a form to launch an email blast. Or you can create a system that continuously checks for certain criteria like new orders before triggering an email blast. Your users don't even need to know that Total Access Emailer is running in the background. Complete details of the Runtime License are included in the License Agreement. 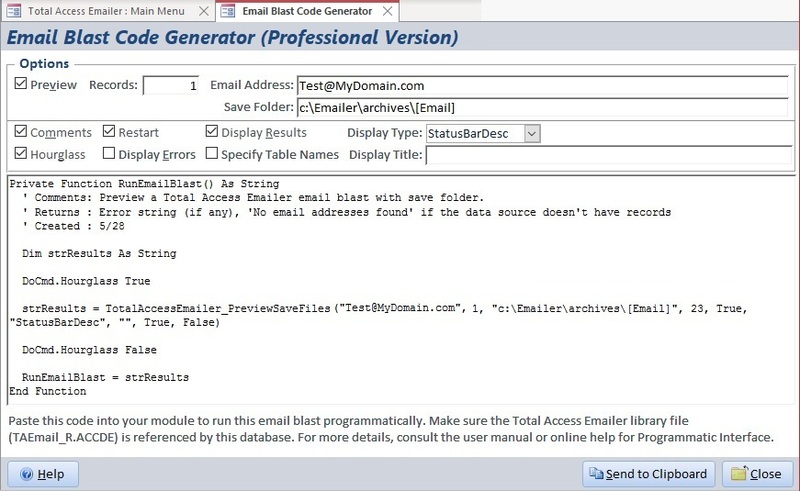 In the latest version, the add-in has a Code Generator to automatically create the VBA code to run or preview an email blast. Simply paste it into your module. 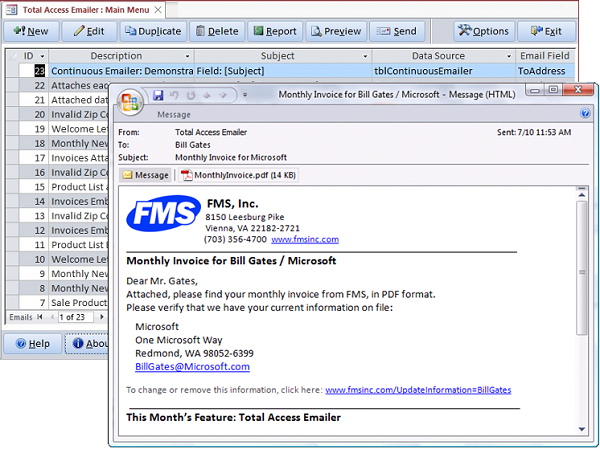 Total Access Emailer is a member of FMS' award-winning family of	add-ins for Microsoft Access. Discover why FMS is the world's leading developer of MS Access third party products with customers in over 100 countries. Total Access Emailer comes in versions specific to each version of Microsoft Access. Purchases are available with electronic software download (ESD) and physical delivery of a CD and professionally printed user manual. The Professional version of Total Access Emailer offers a VBA Programmatic interface and runtime library. It includes royalty-free redistribution rights to non-Total Access Emailer owners. Total Access Emailer is licensed on a per user basis. Each user who runs the program must have a license. Sending email from MS Access couldn't be easier! We guarantee Total Access Emailer will pay for itself and extend the power of Access and your work. You'll be delighted with its flexibility and ease of use. You'll quickly discover how improved email communication with your contacts generates results. If you are not completely satisfied with Total Access Emailer, return it within 30 days for a complete refund.